Syria threatens no one. It hasn’t used chemical weapons against insurgents or its own civilians. Claims otherwise are fabricated. In contrast, Israel is nuclear armed and dangerous. It maintains large chemical and biological weapons arsenals. More on that below. In 1986, Dimona nuclear technician/heroic whistleblower Mordechai Vananu revealed important documents, photos, and other scientific evidence. They proved Israel began producing atomic weapons since at least the 1960s. Years later, thermonuclear warheads were manufactured. It’s believed Israel’s arsenal includes hundreds it won’t admit to publicly. It’s missile capability can deliver them long range. So can its nuclear submarines. Vananu revealed Israel’s nuclear program. He provided credible evidence. Doing so cost him dearly. In 1986, Mossad agents lured him to Rome. They beat, drugged and kidnapped him. He was secretly tried. He was convicted on espionage and treason charges. He got 18 years in prison. He spent much of it in brutalizing solitary confinement. He suffered cruel and barbaric treatment. Vananu said “I am neither a traitor nor a spy. I only wanted the world to know what was happening.” People everywhere have a right to know. Vanunu’s prohibited from leaving Israel. His fundamental rights are denied. He received numerous Nobel Peace Prize nominations. Israel denies him freedom. It’s for doing the right thing. He, Edward Snowden, Bradley Manning, and other heroic whistleblowers deserve universal acclaim. Instead they’re ruthlessly vilified, hounded and punished when apprehended. Snowden’s free in Russia. He’s unable to go home. He fears for his safety. No matter how secure he is in Russia or elsewhere, he’s threatened for the rest of his life. “There’s no saving me,” he says. It’s for good reason. Perhaps Mossad will try to abduct him. It wouldn’t surprise if it attempts replicating how it entrapped Vanunu. Rogue agencies operate this way. CIA, NSA, Mossad and Israel’s secretive Unit 8200 perhaps are the worst. They operate extrajudicially. They make their own rules. They’ve done it throughout their history. Returning Snowden to America very much is US policy. Israel won’t discuss its weapons of mass destruction. It never signed the Nuclear Non-Proliferation Treaty (NPT). In 1993, it signed the Chemical Weapons Convention (CWC). It refused to ratify it. It did so for spurious reasons. It wrongfully claims it’s surrounded by hostile neighbors. Israel’s only enemies are ones it invents. It never signed the 1972 Biological Weapons Convention (BWC). Its policy is CBW ambiguity. In 1993, the US Congress Office of Technology Assessment WMD proliferation assessment said Israel has undeclared offensive chemical warfare capabilities. It uses banned weapons in all its conflicts. They include chemical, biological, and radiological ones. Hideous new weapons are tested. Injuries never seen before are reported. Bodies with dead tissue showed no apparent wounds. Corpses were found shrunken. Civilians had heavy lower limb damage. Amputations were required. Internal wounds had no trace of shrapnel. Corpses were blackened. They weren’t burned. Some badly wounded victims didn’t bleed. Explosives containing toxins and radiological materials are used. They burn and destroy bodies. They do so internally. They leave permanent deformations. Unknown toxins believed to be nerve gas is used. So is white phosphorous. It burns flesh to the bone. Depleted and enriched uranium weapons spread radioactive contamination. Close-range explosives cause severe injuries. Victims lose legs. Abdomens are sliced open. Some people are too far gone to be saved. The Israeli Institute for Biological Research (IIBR) is top secret. 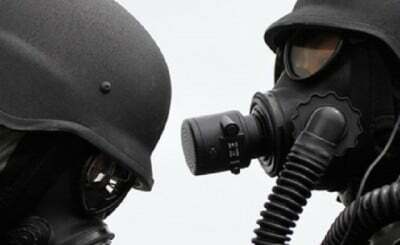 Hundreds of scientists and technicians develop chemical and biological weapons. They’re used in combat. Its publications discuss research on various agents and toxins. They include plague bacterium (Yersinia pestis), typhus bacterium (Rickettsia prowazekii), staphylococcal enterotoxin B (SEB), rabies, anthrax bacterium (Bacillus anthracis), botulinum bacterium (Clostridium botulinum), botulinum toxin, Ebola virus, and nerve gas agents like sarin. In terms of life science capability, Israel’s ranks among the world’s most expert nations in biology, chemistry, biochemistry, molecular biology, genetics, neuroscience, and clinical medicine. Its biotechnological expertise is sophisticated and innovative. Its bioscience infrastructure is modern and well-funded. It provides what experts call “breakout” capability. Its activities are top secret. Official policy prohibits discussing anything related to Israel’s nuclear, chemical or biological programs. Doing so is considered treason. Vananu learned the hard way. It didn’t diminish his passion to expose important truths. IIBR works closely with Israeli military and intelligence operations. Strategic priorities are agreed on. They relate to what Israel wants for combat use. What existed decades earlier is likely far more expansive and sophisticated now. Israel doesn’t develop expertise to abandon it. CIA intelligence uncovered evidence of Israeli chemical, biological and radiological weapons development decades ago. It dealt mainly with unproven allegations of Soviet chemical and biological weapons use in Afghanistan and Southeast Asia. It was believed virtually for sure to be sarin. In 1988, Israeli historian Avner Cohen’s book titled “Israel and the Bomb” said Prime Minister David Ben-Gurion secretly ordered developing chemical weapons. CIA officials first learned about Israel’s chemical weapons in the early 1970s, said FP. It discovered test grids for them. They’re specially instrumented areas. They’re used to measure the range and effectiveness of different chemical agents. They include nerve agents like sarin. They’re tested in simulated situations. It’s done under varying climate conditions. Israel did so secretly in barren Negev desert areas. Following the 1973 Yom Kippur War, CIA intelligence said Israel accelerated its program. NSA spied on Israel. It still does. It intercepted communications showing Israeli fighter-bombers conducted simulated low-level chemical weapons delivery missions. They did so at a Negev bombing range. At the same time, Israel’s nuclear arsenal grew “both in size and raw megatonnage.” CIA officials were quoted saying Israel has sophisticated nuclear weapons. It’s actively engaged in developing other weapons of mass destruction. Further elaboration didn’t follow. It discovered them at the Dimona Sensitive Storage Area.” It’s based in the Negev desert. It’s in a virtually uninhabited area. It’s located east of al-Kilab village. It’s 10 miles west of Dimona. It’s heavily protected. It includes 50 buried bunkers. They’re surrounded by double barbed wire fencing. Large-scale security forces are present. Two miles northeast, another complex is heavily guarded. It’s protected the same way. It covers about 40 or 50 acres. It consists of three large storage bunkers. It includes a buried production and/or maintenance facility. It may be where Israel produces sarin and/or other nerve agents. Whatever Israel had then is likely far more expansive and sophisticated now. Evidence from Israel’s wars on Palestine and Lebanon suggests so. Israeli policy reflects do what we say, not what we do. On September 11, Netanyahu wrongfully accused Syria of using chemical weapons against its own people. “We must make sure that the Syrian regime is stripped of its chemical weapons, and the world must make sure that whoever uses weapons of mass destruction pays a price for it,” he said. He ignored his own government’s culpability. He ignored crimes of numerous Israeli leaders preceding him. “The message that is received in Syria will be received loudly in Iran,” he added. Israel refuses to sign NPT. It never ratified CWC. It won’t permit international inspections. It operates lawlessly. It does so covertly. Washington and other Western states turn a blind eye. They do so despite Israel’s global threat. They wrongfully focus on Syria and Iran. Both nations threaten no one. Claims otherwise are fabricated. Iran was one of NPT’s first signatories. It ratified CWC. Syria ratified NPT. It pledged signing and ratifying CWC. Israel’s a nuclear, chemical, and biological weapons outlaw. Syria promises full compliance with international treaties, conventions and protocols. It’s wrongfully targeted. It’s shamelessly accused of numerous insurgent crimes. They include chemical weapons attacks, numerous massacres, and gruesome atrocities. World leaders point fingers the wrong way. They let Israel get away with murder. They do so repeatedly. They’re complicit in Israel’s worst crimes of war and against humanity. Don’t expect them on the right side of history ahead. They’re allied with Washington against Assad. They want Syrian sovereignty destroyed. They want pro-Western subservient governance replacing it. They want Iran isolated. Obama wants war. Russia’s peace initiative slowed him. He’s not deterred. His war plans are unchanged. He could initiate them any time. It could happen sooner than expected. Doing so may be one more major false flags away. Reports suggest one targeting Israel. Perhaps Obama’s conspiring with Netanyahu and insurgent fighters to launch it. For sure bombs away would follow.